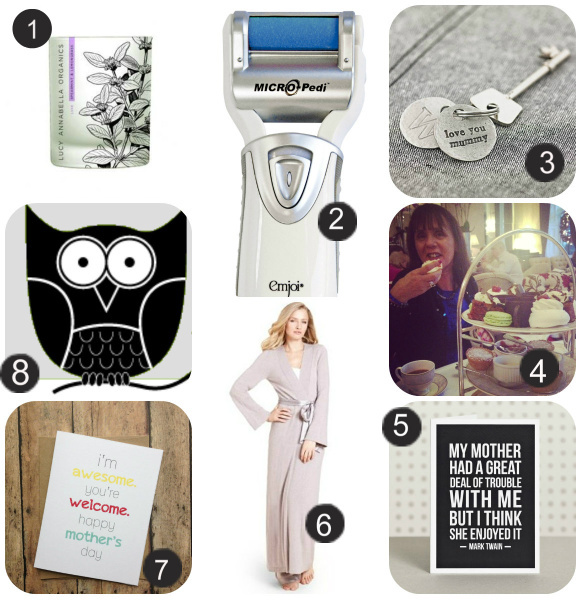 Mothers Day Giveaway and Gift Guide! If you live outside Ireland or the UK then you can relax, you’re off the hook. But for us, Mother’s Day is this Sunday, March 10th. If you’re stumped for a present then this little round-up should help – plus, keep reading for details of a flash giveaway that could solve your gift giving woes! ONE: I’ve recently discovered Lucy Annabella Organics, a lovely Irish brand offering luxury cosmetics and candles, like this Spearmint and Lavender one pictured. Three other candle varieties are also available, and they range from €36-€42. Find them on MiseBeauty.com. TWO: The Emjoi Micro-Pedi is a genius at-home pedicure system that really works. The battery operated rollers make short shrift of dry, rough skin and will have your mum sandal ready in seconds. It’s €49.95 and I reviewed it here. THREE: For unique personalised gift options, check out Not On The High Street – this keyring is just €12.23 and you can change both the message and the initial to suit. FOUR: If I lived in the same country as my mum, I’d be taking her for afternoon tea – one of life’s greatest pleasures! Here she is tucking into the spread at The Shelbourne on her last visit. FIVE: You can find a great range of cards on Etsy with a bit more personality than the norm. This Mark Twain one from doodlelove caught my eye - I know at least half of it's true, and can only hope the other half applies! SIX: In an ideal world I’d be sending my mum this Rosie for Autograph cashmere dressing gown from Marks & Spencer. Sadly the €270 pricetag falls just a little out of my budget - sorry Mum - but M&S offer a range of alternatives from around the €30 mark onwards. SEVEN: Another Etsy Card I can just imagine my youngest niece giving to my sister. In fairness, she is pretty awesome - and her sister is equally amazing. Find it here. EIGHT: For something a little unexpected, why not try Gift Owl – give them a few details about what your Mum might like, confirm your budget and they’ll do the rest. Prices start at just £12.99 (it's a UK service) and your handpicked and personalised gifts will arrive parcelled up in brown paper and string. But this year, you could have Mother's Day all wrapped up because the lovely people at Emjoi have given me two Micro-Pedi's to give away. Both prizes are worth €49.95 and I've actually gifted one of these to my Mum in the past, so I can tell you it will go down a treat. Open to Irish and UK followers, to enter just like both Emjoi and Fluff and Fripperies on Facebook and pop your details into the widget below. You'll also have the chance to gain a few extra optional entries if you'd like. Best of luck! Keep up the gr8 work, love the eye-shadow reviews. HOpefully the Spring ones are one to look forward to! I subscribed to your blog long ago and is in my Gmail reader. I love the keyring for Mum. I love the gift ideas on Not on the High Street! Lovely giveaways in there and some of them looked so gorgeous. Lovely selection of gifts Emma! Lovely giveaway. I really love that Mark Twain quote, it's such a different present & it's really cute. Great gift ideas - been struggling this year for Mama's gift. Looks like an ideal gift! I love your posts on skincare. I have hormonal acne & dehydrated skin & have picked up so many tips on managing it thanks to your blog. I love those candles! my Mam is a huge candle fan! i love the 'love you mommy' key chain...that is so cute! Oh thank god, I saw the title and was like: ''Mother's Day?? Uh oh...'' :-) I think Mother's Day is in May here. The micro pedi looks like the coolest product in your roundup! Alas it is too bad I can't enter the giveaway, but good luck to all! Would love to win this fab prize!! These are such great gifts. Maybe you can email this list to my husband. Ha! i think the eyeshadow reviews and the lip products are the ones that caatch my eye the most :) Oh and nail polish! I'd probably go out and buy one of these even if I don't win, I'm really particular about feet and these look great! Oooooh, a cashmere dressing gown- that sounds good. A little out of my price range too. Great ideas emma! We celebrate Mother's Day in May, so I have a little time. Good luck to all that enter! Great ideas! Mother's Day over in Luxembourg is only in June so I still have a little while to consider. I wish we had places that offer afternoon tea over here! I enjoy browsing your blog late at night on my iPhone. I enjoy everything but mostly reviews on make up & nail polishes. All of these look like wonderful. I think any mom would enjoy these gifts. Mother's Day isn't until May here in the US. I love reading reviews, hauls & favourite posts! I love all your new product features and advice! I would like them all - even the awesome card. And yes, that's very Isabella! Monkey! The pedi thing - i want. i need. i must own. Your gift guides are awesome! Thanks for this! I've been trying to think of something to get my mum for weeks! its also her birthday next week! My favourites are product reviews or outfit posts!